View More In Pocket Knives & Folding Knives - Page 4. Kershaw’s Cryo II is the big brother to the original award-winning Cryo, designed by custom knifemaker Rick Hinderer. The razor-sharp 3.25” blade is made of precision heat treated 8Cr13MoV stainless steel offering excellent toughness, edge retention, and corrosion resistance. The Cryo II is coated, head-to-toe, with a matte-gray titanium carbo-nitride for increased hardness, edge maintenance and overall longevity of the blade and handle. 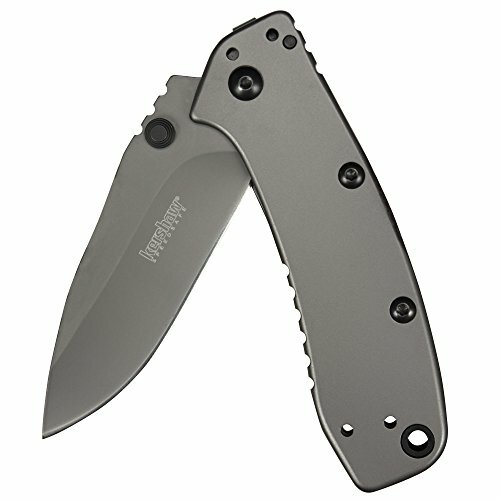 The stainless handle is equipped with Kershaw’s SpeedSafe assisted opening system, enabling lightning-fast blade operation with one hand, utilizing the built-in flipper or thumbstud, safely keeping fingers out of the way. A sturdy frame lock securely locks the blade open during use and a Hinderer lockbar stabilizer ensures the lock doesn’t over-extend. The Cryo II is thin for its size and rides comfortably deep in the pocket with a 4-position deep-carry pocket clip. The Cryo II’s tactical good looks and Hinderer design make for a perfect everyday carry.